Understand this ever-popular “keep it simple” design philosophy to achieve the look for your own interiors. Once in great a while, a style comes along that captures such a wide audience that its popularity is, well, unshakable—and clean, minimalist Shaker style is a prime example. Today, 150 years after the Shakers (a branch of Quakerism) settled in the United States, their contributions to construction and furniture design still enjoy widespread appeal. If you’re interested in this basic yet beautiful look, read on to learn how it evolved and how you can bring it into your home. During the mid-1800s, Shaker communities dotted the New England landscape. Their commitment to leading simple lives led to the development of the Shaker style, which features unadorned lines, unrivaled craftsmanship, and an assurance of quality. In the midst of a quickly changing 19th Century, when mass production began to replace handcrafted quality, the Shakers remained firmly committed to superior workmanship. Their devout beliefs that simplicity, order, and neatness surpassed ornateness served as the foundation for their no-frills designs. Buildings, cabinetry, and furniture were intended to fulfill a need, rather than serve as décor. Shaker residences, called “dwelling houses,” borrowed their rectangular box design from federalist and Greek Revival architecture, but removed all traces of ornamentation—no columns, no wraparound porches, and no fancy millwork. Every element of Shaker construction was functional. Shutters, when used, were built on the insides of dwellings, and were operable, to block out harsh sunrays or frigid winter drafts as necessary. Shaker dwellings housed many residents and so were often quite large, reaching three and four stories in height and topped with simple gable roof lines. Everything the Shakers built was utilitarian and often balanced in design from one side to the other—for example, the two large fireplaces at opposite ends of the dwellings. Interiors were divided into two nearly identical halves, each served by a separate staircase, because Shaker brothers lived on one side and Shaker sisters on the other. Many Shaker dwellings were framed from wood timbers, and featured shiplap siding, while others were constructed of brick and limestone. Meeting houses were the largest structures in the communities, and in some Shaker villages, they were built in a circular design, featuring high interior ceilings, and painted all in white, outside and inside, to symbolize the purity of their faith. The most enduring contribution the Shakers made to the world of design is utilitarian furniture with plain lines. Simple ladder-back chairs, no-frills tables with square legs, solid wood cabinets, and well-built wardrobes were constructed using strong joinery techniques. Their use of complicated dovetail joints and wooden peg assembly took extra time but set a high standard for quality construction. Remaining pieces of original Shaker furniture (for the most part in private collections and museums) are in exceptional condition, due to the superior craftsmanship that went into their construction. The traditional ladder-back chair was first popularized by the Shakers and then adapted by furniture makers all over the world. The simple cabinet door style introduced by the Shakers is still a favorite today among those wanting an unpretentious vibe. Modern cabinet makers continue to follow the Shaker principle of five-piece construction—one piece for the flat door panel and four additional boards that form a frame on the face of the door. This method of Shaker style construction prevented warping and gave the doors superior strength. In their mission to create utopian communities that replicated heaven on earth, the Shakers incorporated light into virtually everything they designed. With no decorations in their rooms, a single large window could create a halo-type effect as it radiated light to the rest of the room. Daylight was their light of choice, and they came up with some resourceful ways of using it. Rooms and hallways in the interiors of large dwelling houses, depended on “borrowed light.” By installing windows in interior walls between rooms, such as a dividing wall between two bedrooms, the Shakers cleverly directed illumination from well-lit rooms to dimmer ones within the dwelling. Skylights directed extra light downward over wooden staircases, which eliminated the need for candles and lamps during daylight hours. Wood floors, furniture, and staircases were varnished to protect them from humidity and temperature fluctuations, but the Shakers did not use wood stain to enrich the natural color of the wood. The tone of the wood in the dwellings was dependent on the type of wood available in their region. Strong hardwoods, including oak, pine, maple, apple, pear cherry, walnut, and hickory were commonly used for both furniture making and to construct interior wood elements such as staircases. The Shakers used white paint to protect the exterior of their buildings, while interior walls were finished in hand-applied and smoothed plaster, which offered a satiny-white hue. Shaker rules allowed a minimal splash of color, often solid blue, for chair pads. Multicolor fabrics and patterns were avoided. 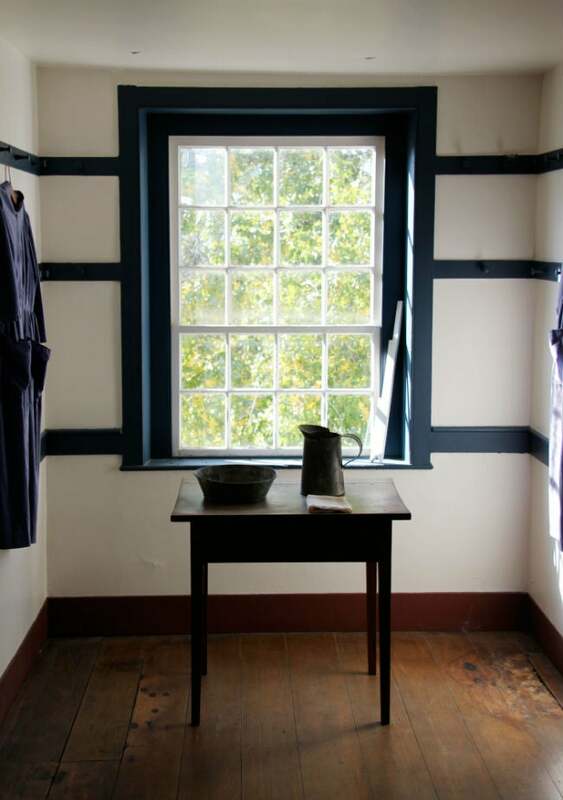 While most Shaker walls were white with natural wood trim, some of the earliest Shaker dwellings incorporated painted yellow trim and doors. 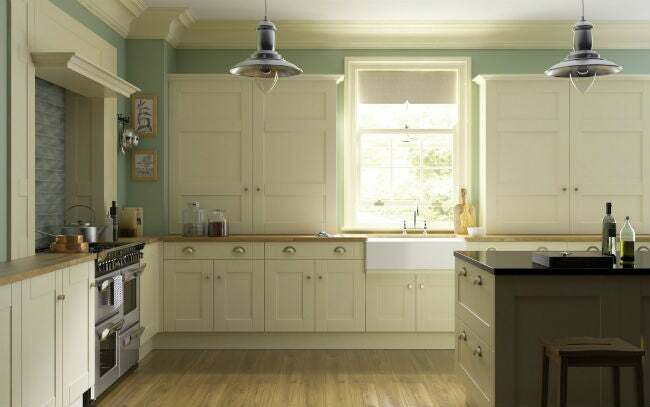 Because it offers a sense of serenity in a hectic world, Shaker style remains a timeless favorite. 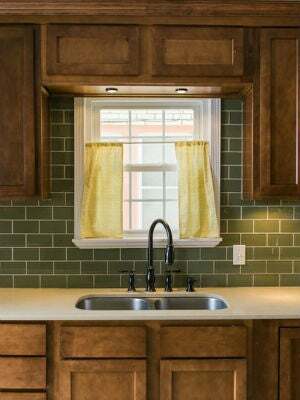 Building a new house along Shaker architectural lines isn’t feasible for most, but by incorporating Shaker elements in your home, you can achieve a similar sense of minimalism and modesty. • Paint walls and ceilings soft white. The Shakers used white extensively to create a sense of purity and luminosity within their dwellings, stores, and meeting houses. • Think “monotone” when selecting decor. In a Shaker dwelling, the only colors—besides the white of the walls and the wood tones of the floors and furniture—were the natural tans of cotton and linen cloth used to make bedspreads and cushions, and the occasional colored seat cover. If you choose to add a splash of color, make it a muted one in a solid design: Sage green throw pillows, a natural wicker basket to stow reading materials, or a braided country blue throw rug will add a bit of color without detracting from the Shaker style. • Install picture rail and chair rail on walls. Chair rail, a narrow trim board that runs horizontally along walls, about 28” above the floor, offers visual appeal while protecting walls from the bumps of chairs being scooted backward. Picture rail, another narrow horizontal trim board, can be installed at eye level or slightly above. 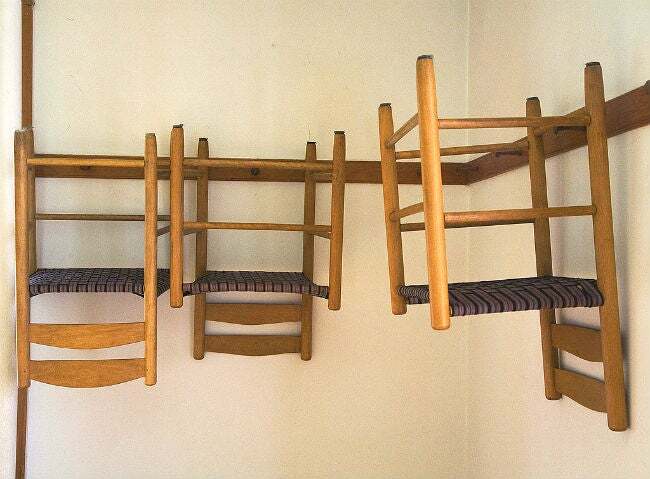 While picture rail is often used today to hang artwork, for the Shakers, it was purely functional; pegs were attached to the rail to hold coats and hats. • Add Shaker-style furniture. 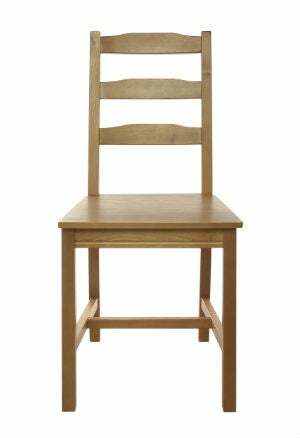 When it comes to Shaker style furniture, less is more and plain rules over fancy. An eat-in kitchen is a perfect spot for a modest square or rectangular solid wood table, complete with ladder-back wood chairs. Invest in a plain wood rocking chair for an added touch. Shakers were permitted one rocker per room. Choose natural wood dressers, nightstands, and wardrobes that feature flat-front doors and drawers. • Take pictures off the walls and clear away clutter. Artwork was shunned, so true Shaker style walls should be free from pictures. Store family photos in photo albums. For an authentic bit of wall décor, hang an old-fashioned bonnet or a natural-bristle flat broom (the Shakers invented the flat broom) from a peg on the back of a door or on a picture rail. Keep only the items you use on a daily basis on countertops, and stow your toaster and coffee maker out of sight. • Replace curtains with operable interior shutters. Real wood shutters (unpainted) provide privacy when closed, let daylight stream in when open, and add an authentic touch of Shaker design to your room. • Update kitchen cabinets with new faces and iron hardware. Even if you can’t afford an entire kitchen remodel, you can replace existing doors and drawer fronts with new Shaker-style doors and fronts. Choose simple black iron hinges and pulls to complete the Shaker look. Opt for plain white or linen-colored hand towels.